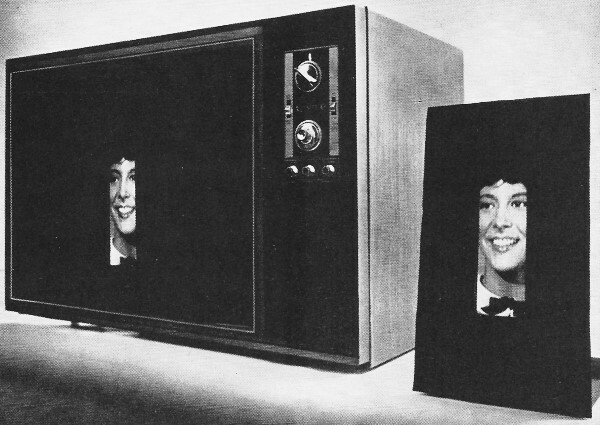 Although not routinely referred to as plasma displays at the time, the "thin TV displays" reported in this 1973 article in Popular Electronics magazine was one of the first instances of commercially viable schemes. According to Wikipedia, Fujitsu introduced the first full-color plasma display panel (PDP) in 1992 - with a 21" screen - two decades after this device 80x212-pixel monochrome designed by Zenith. I remember seeing the 42" Fujitsu plasma TVs in Best Buy with a $10,000 price tag sometime in the mid 1990s, which jives with Fujitsu's stated plan of selling the first units at around 1 million yen (~$8,800 at today's exchange rate). Prior to the advent of plasma displays, rear-projection screen televisions were the main way to get really large displays. While rear-projection displays suffered from narrow viewing angles, plasma displays suffered from pixel burn-in that gradually reduced contrast to annoyingly low levels. Both options carried a relatively large price tag compared to 25" and 27" CRT televisions. Research scientists from Zenith Radio recently unveiled their version of a thin TV display panel whose 5/8" thickness produces a picture that, except for brightness, rivals that of a conventional CRT. 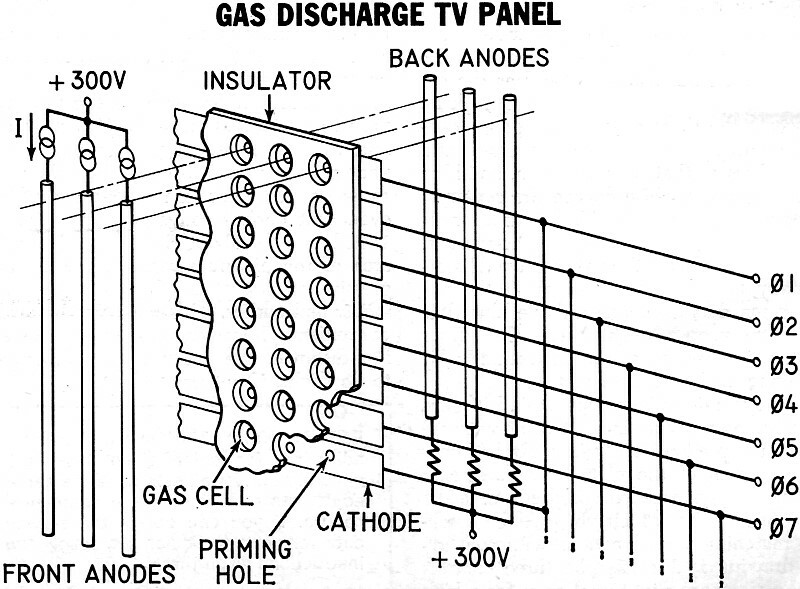 The experimental unit uses a Burroughs "Self-Scan" panel consisting of 80 columns and 212 rows of gas cells, at present producing a red picture due to the neon gas used. At the present state of development, the panel has a peak luminance of 8 foot-lamberts, and a contrast ratio of 40:1. In operation (see at left), a full line of cells is addressed at the same time and the incoming video is stored in 80 individual capacitors that control the current sources for each column. Modulating these currents produces a wide-range linear gray scale. Comparison between the thin panel and conventional color receiver. Without the associated electronics, the panel is only 5/8" thick. The illumination time of the full line of gas-discharge cells is 60 microseconds compared to the 100-nanosecond excitation time of each phosphor dot in a color CRT. In the thin panel, light is emitted from each cell only as long as the current is applied, and there is no persistence. 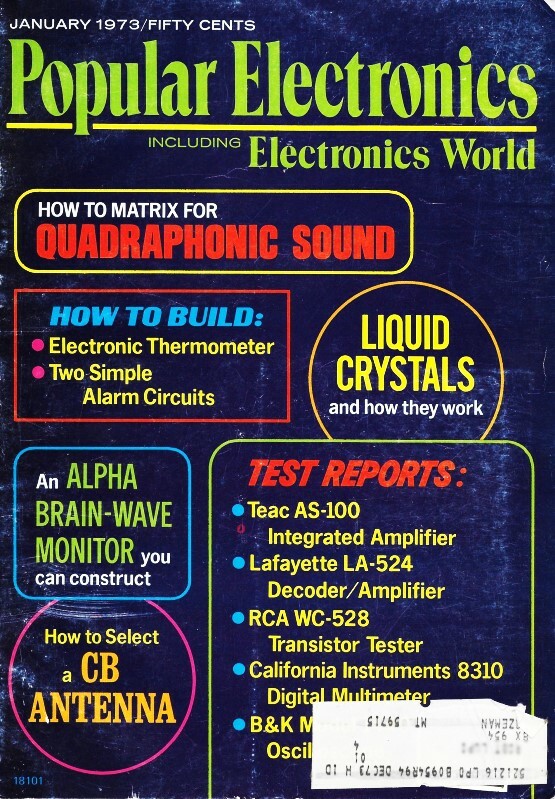 In the test demonstration, the 5/8" thick panel was 2.4" wide by 6.3" high and the 25" color CRT was masked to show a picture of the same dimensions. 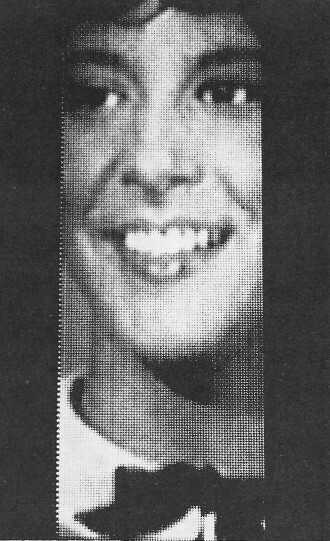 The apparent picture resolution was similar as the photos show. Dr. Robert Adler, Zenith vice president of research said, "What we have learned is encouraging. However, there are many problems to be solved before these panels can be considered for product use. 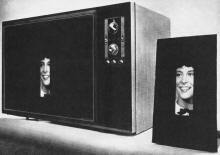 The present panel produces a red monochrome picture, and three colors must be produced in the panel. Each column of the display requires a driver which in a commercial unit would mean 1500 separate drivers. 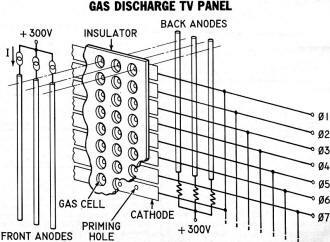 This will require IC's that can handle the needed voltage. And, finally, much higher luminance and better power utilization will be required." 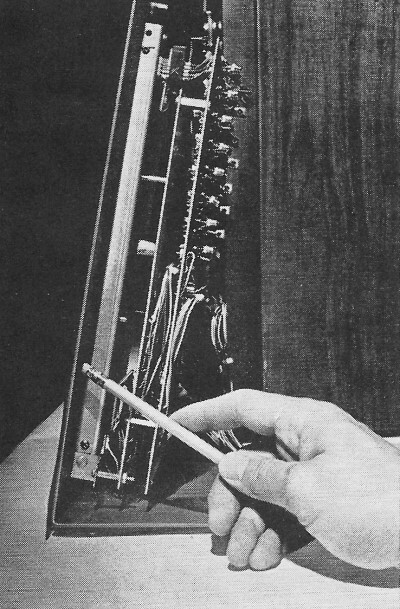 The receiver screen is masked to show same area as panel. (Right) Close-up of panel shows excellent resolution.